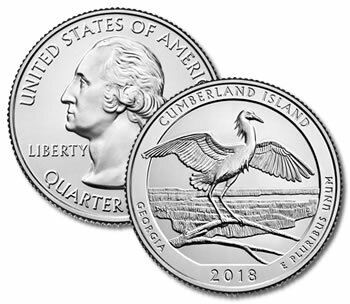 Cumberland Island National Seashore in Southeastern Georgia is the 44th site to be commemorated upon United States Quarters within the U.S. Mint's National Park Quarters series. The design features a Snowy Egret perched stop a branch with a salt marsh backdrop. Only accessible by boat or ferry, the over 36,000 acre Cumberland Island Seashore is popular tourist destination with its abundance of natural and historical national trerasures.